Yeah, it’s cold and flu season again. Ever since my little guy started at daycare he brings home every single virus in the world and rubs it all over me. I now fancy myself as a bit of a cold connoisseur. There are the sniffles and the whoppers, and everything in between. Some have sinus headaches, sore throats, a cough, and other unpleasantness. But, for me, the absolute worst is the congestion. When it feels like someone has poured cement into my sinuses and I can’t breathe AT ALL, I want to crawl out of my body. My doctor recommended breathing in steam with eucalyptus or lavender. You know, the head-in-a-bowl-with-a-towel-over-you method. Which, I must say, does work wonders. And if I had the patience and the time I would do it every day. Cold or no cold, life must go on and that means I needed a faster method for breathing in steam and scent. So on most days that I have a cold (which is most days in the winter) I deal with sinus congestion with eucalyptus shower steamers. 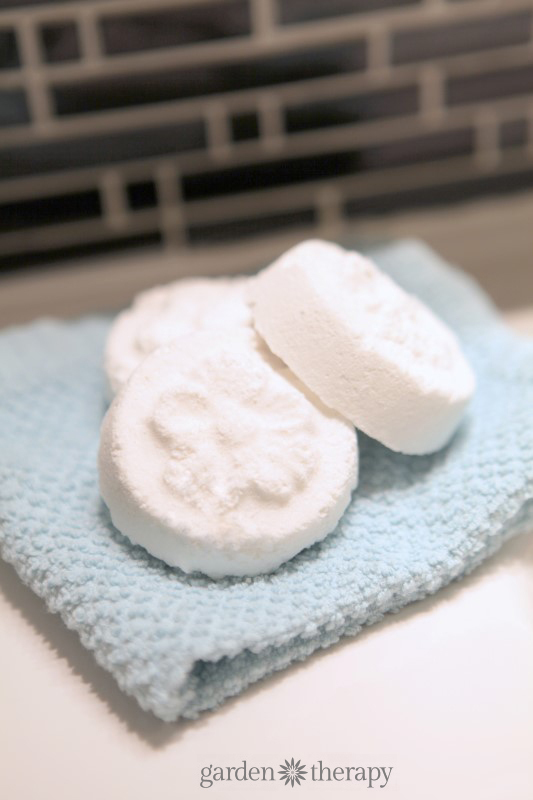 They are refreshing and soothing when bubbling in the shower, which helps to get me going each day. They are now my daily aromatherapy and I’m grateful for the no fuss, no mess relief. In a bowl, mix the citric acid and baking soda. Add the essential oil and mix that in well using your hands. Pour the witch hazel into the spray bottle and spritz some onto the top of the powder mixture. Mix the witch hazel in quickly with your hands, spritz some more on top, mix again, and repeat until the mixture packs together easily. Make sure you don’t get it too moist or the mixture will begin to fizz. Scoop the mixture into the molds one at a time and pack it down tightly so that it holds together. Once the molds are all filled, flip them over onto a clean, hard surface and tap the bottom to release the steamers. Allow them to dry for at least 24 hours before use. 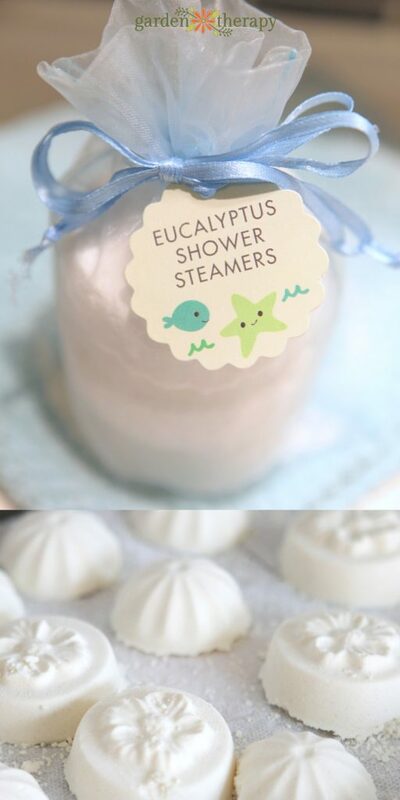 Pop one of these on the shower floor and when you run the warm water it will cause the steamer to fizz and melt, releasing soothing eucalyptus into the steamy air. Why use the Witch Hazel instead of water? Oh that’s good to know. My shower is stone and it doesn’t get slippery at all. But I can imagine on a smooth surface it would. Thanks for letting us know. Stephanie, very beautiful! How did you make your tags and do you have them wrapped in cellophane or plastic? Thank, Paula! They are in an organza bags and I made the labels at Evermine Occasions.